These Rhubarb Pudding Recipes include the very best homemade puddings for a scrumptious dessert idea with rhubarb including bread, cream and tapioca puddings. Bread, cream, and tapioca puddings, are always welcomed dessert ideas. These puddings are great served alone, or with a specially prepared rhubarb sauce. Check out the recipe for pudding with rhubarb and strawberries. These two foods are often harvested at around the same time of the season, so why not combine the two - sweet and a little tart ... makes a great combination! Used like a fruit in these recipes, rhubarb is delicious in both hot and cold puddings. I always think of puddings (especially hot pudding) as a "comfort food"...and a great finale to any dinner, whether a large or a small supper. When I grew up, my favourite dessert was a warm pudding dessert. I guess it was a "comfort food" for me, as, unlike ice cream, or another frozen or cold dessert, warm pudding always allowed for cosy, quality family time. We chatted as we slowly ate our warm, homemade dessert, enjoying the extra time together! ... Thanks Mom ... I have good memmories of dessert time at home! 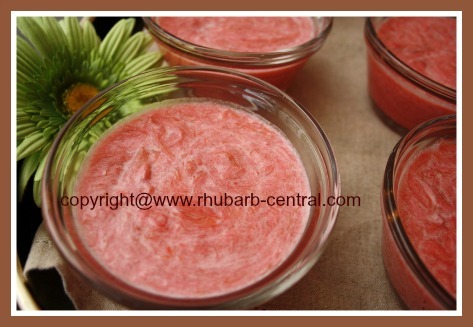 If you grow rhubarb, you will find making rhubarb desserts such as pudding, a thrifty idea too! Perhaps you have made many recipes using rhubarb, but never tried a rhubarb pudding, why not try something different? If you are visiting Rhubarb-Central.com and you have a favourite pudding recipe that you make with rhubarb, I would love it if you would share the recipe and a picture(s) with other visitors to this website. Please visit me via my contact me form and I shall get back to you with an email address to sent the recipe information! Proper credits will be given as requested.